Petomato is the convenient way for anyone to enjoy gardening. Grow your own tomatoes indoors! Petomato is a simple and convenient way for anyone, anywhere to enjoy gardening. Seeds are planted in a recycled plastic bottle and placed in a spot with adequate sunlight. The Petomato with a small amount of care and attention produces cherry tomatoes in about 3 to 4 months. Now you can grow your own cherry tomato plant indoors 365 days a year. 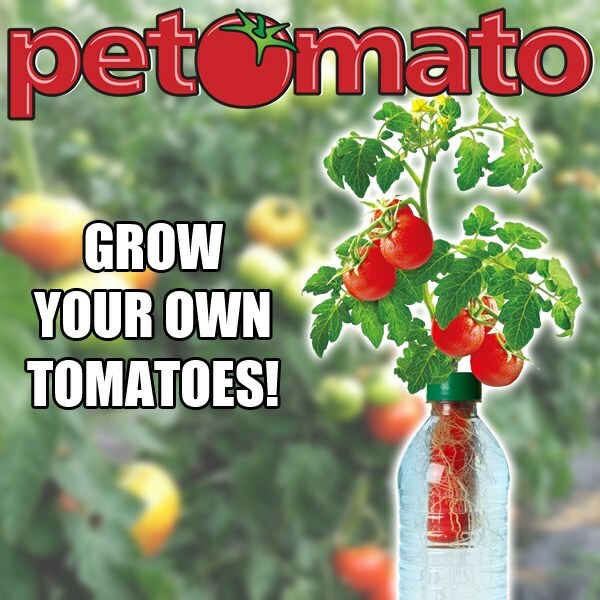 Petomato includes: Petomato Growing Tube, cherry tomato seeds, sand, fertilizer, measuring spoon and detailed growing instructions. This product is made for use in a recycled bottle. This product grows one cherry tomato plant hydroponically. Petomato is great for kids, teachers, seniors or anyone who wants to enjoy the miracle of gardening at home. Caution: Choking Hazard. Not for children under 3 years of age. Do not ingest seeds, sand, or fertilizer. Do not feed seed, sand or fertilizer to pets. Growth and cultivation results are based on growing conditions, cultivation, environment, region and altitude. Sunlight is required.